Earlier this week, a reader sent a link to a very interesting story out of Australia. (Thanks, Elizabeth!) A small town in the outback recently celebrated the return of an antique boomerang that had been stolen from its museum in 1983. The thief--an American tourist, I'm sad to report--had finally sent the artifact back to its rightful owners along with a check. He didn't explain why he'd chosen to return the boomerang after so many years--but I suspect I know the answer. See, the story also mentioned a phenomenon known in Australia as "sorry rocks." 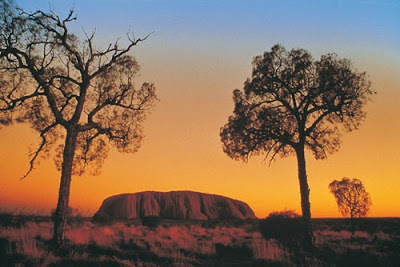 Every year, tourists steal stones from the giant red rock formation called Uluru, despite warnings that the site is sacred to the local Aborigines. Many of those stones eventually make their way back to Uluru--mailed by people who believe the "sorry rocks" have brought them terrible luck. According to some reports, at least one pilfered rock is returned to Uluru every day, and many are accompanied by desperate notes of apology. I thought of the "sorry rocks" when I stumbled upon another story this morning. A young Czech man recently died in a bizarre fire, and when the authorities arrived at his apartment to investigate, they discovered thousands of priceless prehistoric treasures. Pins, brooches, spears, bowls, and rings--each worthy of a place in a museum. Archaeologists believe the young man had been using a metal detector to locate and plunder ancient graves near Prague. Unfortunately for the young man, it appears he never had a chance to say he was sorry. Read more (and see pictures) here. 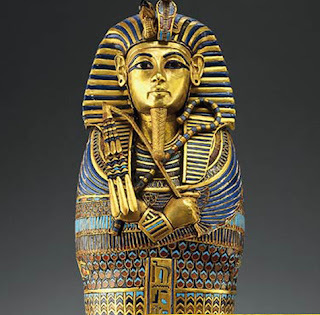 Of course the most famous "deadly souvenirs" were those taken from the tomb of King Tut. You've probably heard of the terrible curse that afflicted many of those responsible for opening the tomb. (If you haven't, click here.) But you may not know that some say the curse is still active. One British woman claims to have come across a forgotten collection of artifacts that her husband's grandfather had taken from Tut's tomb shortly after it was discovered. Since the day of her discovery, she's experienced nothing but illness, tragedy and heartbreak. Unfortunately, her family refuses to sell the items (which are said to be worth more than $2 million). Perhaps a letter of apology is in order? Let's hope she sends one before she suffers the same fate as a German man who stole an artifact from an Egyptian tomb three years ago. Read his tale here. So what's the moral of this story? Be careful what you take! is that like your post on the deadly stones?????!!!? I heard that when the Ancient Egyptians sealed their tombs, they'd stuff the cracks with anthrax powder. I understand their point of view. After all, these archaeologists are breaking into and stealing from the tombs, even if they aren't doing it because of pure greed. I wish someone could do a scientific study about the curse effect, to confirm it really exists and test ways of escaping it. I wanna take a soda bottle and stuff it full of stuff like photos and maps and stuff, and describe how stuff works nowadays, and what the government is like and stuff, and a note saying "Hey archaeologists! Here! I hope this helps! I buried it however many feet underground in this place on this date." What would you think if you dug up something like that? Or you could just not take anything at all. Hazel- That would be pretty cool. About five years ago one of my friends and I buried a milk carton in which we put coins, a few fancy rocks, and a note. It wasn't as interesting as what you suggest, though. That would be an amazing find for an archaeologist in 3047 or something. Yup, a perfect example of karma. Ha, I'm a big believer.